Lying just below the lifts at the Breckenridge Ski Resort are the large and private homes in the Boulder Ridge subdivision - all three sections. Ski Hill Road gently climbs from Breckenridge with the help of a few switchbacks past the town overlook to Peak 8 just there on the crest of the road you'll find Boulder Ridge homes for sale. With full-sized yards and stellar views, this quiet single-family neighborhood has incredible access to alpine and nordic skiing and national forest access. Boulder Ridge was platted 30 years after the resort opened, on the south side of Ski Hill Road, and Boulder Ridge III developed about ten years after that, on the north side. Lots measure at least a quarter-acre, and a few in Boulder Ridge III are an acre or more. Read more about the diverse and beautiful homes, or browse our Boulder Ridge real estate listings below to start your search for that perfect Breckenridge property. Richard Putnam of Wayzeta, Minnesota developed the first phase of Boulder Ridge within the town of Breckenridge in 1991, and in 1993 the town approved a second phase of the neighborhood, which is made up of larger single family houses. The lots are located on Boulder Ridge Drive and Boulder Circle, and some homes were built as early as 1991. A fifth of the lots are undeveloped and run from ¼ to ½ acre. All the dwellings are more than 3,000 square feet with high-end finishes, except three smaller homes, built in Phase II in 1993, which share a common driveway off Four O’Clock Run Road. 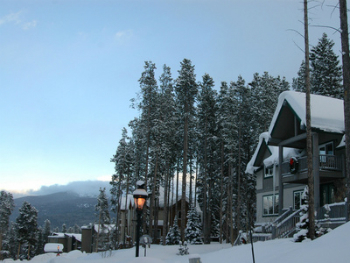 Boulder Ridge is conveniently located to the Breckenridge Ski Resort. Peak 8 and the lower terminus of several chair lifts is about a tenth of a mile down Ski Hill Road, and there are paths to and from them and to nearby Cucumber Gulch Wildlife Preserve and Breckenridge Nordic Center. Peak 7 and the new Peaks Village is another tenth of a mile along Ski Hill. Seemingly removed from town, any Boulder Ridge homes for sale are just a mile by road from the center of downtown Breckenridge. Paved sidewalks along Ski Hill Road make it easy to walk down to town. Trails and skyways offer alternative pedestrian routes that are sometimes shorter. Free shuttle buses and the gondola run often, on seasonally adjusted schedules, from town to Peak 8, and there are bus stops in the subdivision. Size (sq. footage): 1300 sq. ft. to 6600 sq. ft. Size (sq. footage): 3700 sq. ft. -5500 sq. ft. The subdivision includes private trails connecting to Trygve’s ski run. The free bus system stops next to the subdivision for easy access to Main Street, Breckenridge and if you do not want to walk to the lifts take it to the Peak 8 base area. Find out more about Boulder Ridge real estate and homes for sale by contacting an expert from Breckenridge Associates.